All I can say right now is: What the @#*&$ did I just read?? 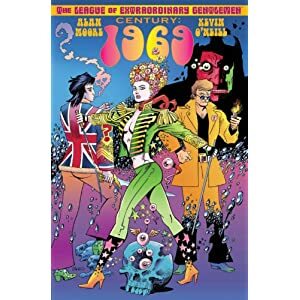 It’s almost as if Alan Moore is secretly laughing at all the suckers who bought this. I need to process this. I have long loved the Sherlock Holmes stories, since I was introduced to them when I was pretty young. I was so enamoured by the stories that it played a big part in my deciding to go to UK for my tertiary studies, just so I can steal a trip down to London to visit 221B Baker Street (I was a little bit of a let-down, looking back after so many years, but it was a dream come true nonetheless). As big a fan as I was, however, I have never yet managed to completely read the canon of stories from Doyle, despite owning multiple editions of the stories, including my absolute treasure: The Original Illustrated ‘Strand’ Sherlock Holmes, which is a compendium of all of the Sherlock Holmes stories by Doyle, reproduced with all the original illustrations from the pages of the Strand magazine as they first appeared! I was pleased to find not to long ago that Audible held a sale and I saw The Complete Stories of Sherlock Holmes, Volumes 1 and 2 being sold at a very tempting price, and seeing that I’m getting a lot of reading done on the road, and relishing the chance to rekindle my love for the detective, I got them both. Volume 1 consists of two novels, A Study in Scarlet and The Sign of Four, followed by a collection of short stories entitled The Adventures of Sherlock Holmes. What can I say, aside from the fact that if you haven’t yet sampled Sherlock Holmes, what the heck are you doing reading my silly reviews than to head down to your nearest bookstore (or online store), buy the darn books and start reading? The short stories are in an easily digestible format, and leads you on to a great adventure in detection. Delightful stories that will have you thinking long after you’ve finished them. Classics such as A Scandal in Bohemia, The Adventure of the Red-Headed League, The Adventure of the Speckled Band are all here. What struck me was the quality of the stories of those that aren’t so famous in this collection, and I’ve always wondered about the fact that some of these stories must be of variable quality to be excluded from the general mindset (unlike say Speckled Band, which I think most English readers would have heard of at one time or another being associated with Sherlock Holmes). On a whole, however, I found the stories to be more or less pretty good. Because I’m listening to them one after another in a continuous fashion, and maybe due to a most excellent reader in Charlton Griffin, I’m picking up some very distinctive Doyle mannerisms in the stories. Sherlock Holmes has a tendency to say ‘pray continue your most interesting statement’, or some variation of this when a client starts to tell their conundrums. And the word ‘singular’ comes up in almost every story – a most ‘singular occurrence’ or most ‘singular event’. And the deductions – sometimes to my jaded mind that some of the deductions seem far fetched. But not nearly as much as the ones from the latter stories. More from the succeeding collections, The Memoirs of Sherlock Holmes, and The Return of Sherlock Holmes. The Razer BlackWidow Keyboard – and incredibly satisfying tappity-tap-tap! Over the years I have been hankering for a mechanical keyboard, ever since I saw the Das Keyboard. It wasn’t the look of the keyboard so much (although a completely label-less keyboard does project a not-undesirable l33t factor), but the promise of a durable, comfortable, and most importantly, the promise of a very audible keyboard click as you tap. I don’t know when I had this idea that the sound a keyboard makes somehow would influence my joy in typing on a keyboard, but it does. There’s a very satisfying assurance and some unspeakable pleasure that emanates from typing on such a keyboard. Since I type reasonably fast, and I type *a lot*, I was looking forward to getting one of these babies. So fast forward to the present. I have long believed that Malaysia doesn’t stock mechanical keyboards. Imagine my surprise that about a month ago, I found out that Razer has recently created a mechanical keyboard called the BlackWidow. After dilly-dallying for a while, I sunk the cash and carried my new toy home. The one I got was the BlackWidow, not the Ultimate edition (which sports USB and audio jacks, along with backlit keys). My first impression after I unpacked it was that it was heavy. I love the weight, and it certainly wouldn’t be sliding around your desk. My second impression was that the keys were a little cramped. I was used to the standard Microsoft/Logitech full-sized keyboard (not the compact design crap where they rearrange the keys to make the whole keyboard smaller, which forces you to take a few days to get used to it, and then screws up all your bearings when you use an actual keyboard on another machine). The BlackWidow does seem smaller somehow, and my first few sentences on it came out as gibberish. However, it’s still a full-sized keyboard, and after getting used to the orientation, the speed came back pretty quickly. It has a row of special macro keys on the furthest left of the keyboard, which caused some irritation when I reached for the left-hand SHIFT and CTRL. However. However. The keys are magnificent to type. The clicks and taps sound full and very satisfying, and they key-presses triggers a tactile switch that makes it a pleasure as my fingers dance through the keyboard. I found out pretty quickly that not all my colleagues were fans of the noise. I wasn’t going to leave it in the office, so lucky them. Since I’ve never yet tried any other mechanical keyboards, I don’t really know how this compares with something like the Das Keyboard, or the SteelSeries7G/6G. One thing they do have going for them is the fact that they are not really so out-and-out gaming centric, a looks a little more subtle, but that’s not exactly a big problem for the BlackWidow (at least for me). Looking forward the many millions of key-presses on this baby.